Imagine everything that could go wrong. Your dog could run away. You could get really sick, be a bad parent, not be able to pay bills. People may laugh behind your back. The Middle East could erupt into chaos, another 9/11, a giant meteor. Consciously or not, we too often live out of our fears. Some we can do something about, others not. But as we take on the big challenges, the world needs us to be more courageous. 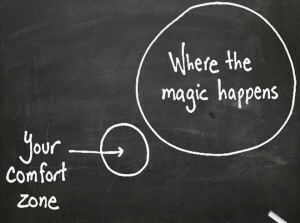 You may have seen this Venn diagram showing where “your comfort zone” and “where the magic happens” overlap (they don’t!). Every positive thing most of us have ever done, big or small, begins with leaving our comfort zone. Magic comes from stretching, risking, having a bit (or a lot) more courage. How does our fear keep us from something important, something magic? Sometimes we just need to realize how irrational our fear is. In Getting a Grip Frances Moore Lappé points out that even though Indians outnumbered their British overlords 300,000-to-one, it still took Gandhi’s reframing for them to realize they could oust them. In You Have the Power, Choosing Courage in a Culture of Fear Lappé and Jeffrey Perkins say that the old way of thinking is “I’m just a drop in the bucket. My effort might make me feel better, but it can’t do much.” The new way to think is, “Every time we act, even with our fear, we make room for others to do the same. Courage is contagious.” They tell the story of the women in the rain. Thirty years ago, Women Strike for Peace helped achieve a remarkable victory: an end to above-ground nuclear testing that rained radioactive fallout worldwide, even showing up at dangerous levels in mothers’ milk. Journalist Rebecca Solnit recalls hearing of a middle-aged member of the group talking about feeling utterly “foolish and futile” as she stood in the rain one morning, sign in hand, protesting at the Kennedy White House. Courage often means little more than taking an action, even if we’re not sure it’s going to work. Every time you leave your comfort zone, it’s scary. Or at least uncomfortable, like getting up 30 minutes earlier to accomplish a goal, or reaching out to someone for the first time. It may not always lead to magic. But magic is less likely without it. Folks at the Case Foundation created an excellent website on Fearlessness in context of social change. They explore five principles: Make big bets. Experiment early and often. Make failure matter. Reach beyond your bubble. And Let urgency conquer fear. You can download the PDF here.